Oops. No, no, no, no. this isn't about a great big sin I've committed that I'm confessing. Hardly. This is definitely quilt related! What happens after years of washing and use when you don't quilt enough? I was pretty new to quilting when I decided to make my niece a quilt. It took me a while to actually finish it and get it to her. I had planned on giving this to her after she graduated from college (or maybe high school)? I didn't finish it that early. I gave it to her some time around her wedding, if I remember right. I knew she loved cats, books, and purple. Unfortunately for me, the only cat and book fabric i could find had brown, and not purple as the main color in it. I worked purple into the stars, but couldn't figure out a good way to get brown in to it. Well, I figured green was a good mixer - because green and brown look good and green and purple do too as well. I didn't realize you needed to actually quilt close together for the integrity of the quilt itself as well as the puffiness or to help the batting stay in place. As i said, this was quite a while ago now. I've learned a lot in the last few years. My niece brought me this quilt and said, "Do you see the problem? How should I fix it? 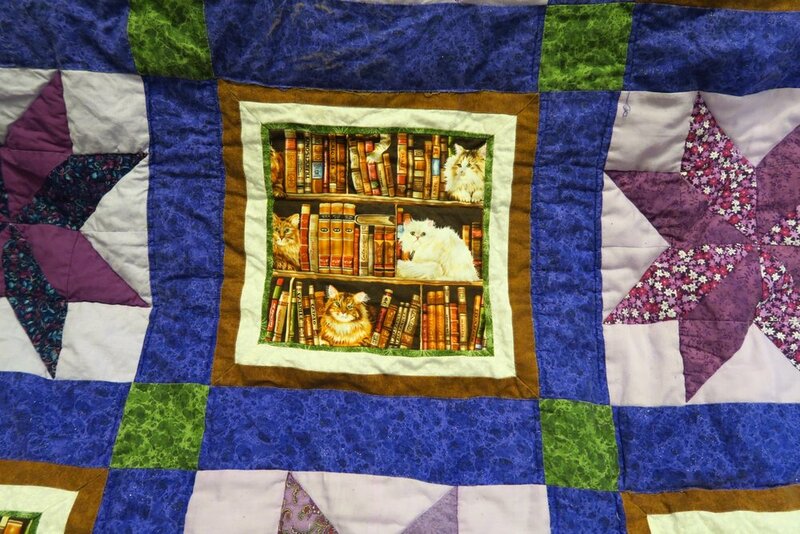 I saw that where the brown and purple were joined, the brown had frayed - but only where I hadn't quilted next to it. There was just too much pressure on those seams - and they had come apart. Well, there isn't really a good way to fix them - not really. Once a seam has actually frayed out - there isn't fabric left to work with. However, I told her I'd fix it -- so I did. I went to mom's Touch 'n Sew machine with not a very big throat, and just pulled that purple fabric over the fraying edges of the brown and top stitched it in place. Not the best fix, maybe, but it worked. Now, I know from personal experience that quilting itself will keep your top together- and not just the seams! It keeps the pulling and tugging from sitting and using the quilt to a minimum. So, a "quilted to death" quilt will probably last much longer than one that is quilted long distances apart. And here I was worried about the batting falling apart or relocating! And now you know - and so do I.
I'm so glad Sarah showed me this quilt - as I had no idea. She and her brother got the first two really nice quilts that I had ever made. Previously all I had done were squares and sashing - including 9 patches. The quilt really should be quilted completely along the line of the purple and brown in the direction where the others pulled out. I'll let her do that, though. I think it will keep the quilt from disintegrating. But...what it tells me is that her quilt has been loved and used. Time for a new one! And this one will be even better!